This snack — gleaned from Girl Scouts — is one of my kids' favorites. With a glass of milk, it's a great afternoon pick-me-up. Pull back one strip of peel on the banana. With a spoon, scrape out and eat the top half-inch of the banana flesh. 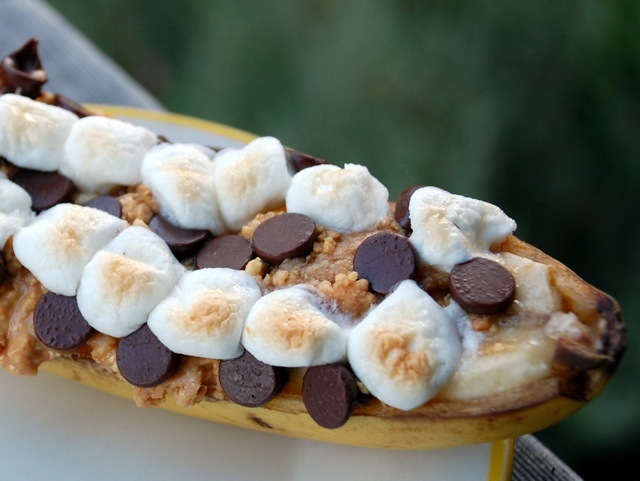 Spread peanut butter over the top of the banana. Arrange, to your liking, the chocolate chips and marshmallows. Turn on oven broiler. Place banana boat under the broiler and broil until the chocolate chips begin to melt and the marshmallows are golden brown.